Amongst the most daunting tasks for the Palestinians has been to make the justice of their ancestral claims to homeland heard against the hegemonised Zionist myths of territorial divine right and defensive privilege, myths predicated on the very nullification of Palestinian identity. Elias Khoury acutely observes that what has characterised the Palestinians is less the injustice perpetrated against them than ‘their deprivation from expressing it’.2 Few would dispute that the, sometimes, gross strategic errors made by successive Palestinian political and military authorities did little to reverse this deprivation by a Western political hegemony in which, post-WW11, anti-Semitism had, as Said suggested, mutated seamlessly into anti-Arabism, both rooted in hostility towards the Levantine.3 But the battle for truth against propaganda has to be engaged on the field of representation. What receive less coverage in the international press than the spectacle of violence voided of historical meaning are the extraordinary richness of Palestinian culture and its struggle for survival and development against ongoing Israeli policies to eradicate it. Whilst information on Palestinian literature, architecture, photography and cinema has widely circulated throughout the past decade, the international visual arts community has only recently turned its attention to Palestinian art. A somewhat cynical view may suggest that, in the globalised commodification of art, the ‘Middle East’ has been amongst the last geographies to be thus ‘colonised’; or, that with the protracted siege of Gaza Palestine has become a fashionable cause célèbre. Aside from a few artists who have already gained an independent international profile, the current emphasis is on a younger generation of Palestinian artists, many supported by foreign educational or cultural exchange programmes and informed of the contemporary aesthetic codes and market strategies of internationalised art. This however leaves an historical vacuum no less damaging to Palestinian cultural continuity than the lack of context within the political sphere. It is therefore an apposite moment for the publication of a scholarly book on Palestinian art that speaks from within the experience of both history and artistic practice that obliges us to confront some truths behind a century of obfuscation. Prefaced by a text and drawings by John and Yves Berger respectively, Palestinian Art From 1850 to the Present is the first comprehensive, authoritative study to be published in English,4 and the culmination of thirty years of original field research by the respected Palestinian artist and writer Kamal Boullata (born in Jerusalem, but subsequently exiled first to Beirut and later to the United States and France). The second major anthology on the subject by the artist,5 Palestinian Art is based on critical essays published in English over the past twenty years. Deleuze’s Proustian axiom concerning the link between time and truth is based in the consideration that ‘truth is never the product of a prior disposition but of a violence in thought’; the search for truth is, in fact, precipitated by what presents itself as a betrayal. (p16) As much as anything it is from the monstrous betrayal by the language of power, which portrays the Palestinian as a pre-modern non-subject that this historiography of Palestinian Art emerges. Speaking as an ‘amateur’ historian Boullata tells us that one of his guiding principles was Said’s essay ‘Speaking truth to power’. Said wrote that the intellectual’s responsibility to a search for truth must be accompanied by awareness of the pressures of ‘interests’ and prejudice that cloud independent judgement in order to give voice to universal non-partisan human principles of freedom and justice. Said noted that this could best be done from the perspective of the ‘amateur’ at a distance from the entrapments of power (in which academics can so easily become implicated), offering the questions: How does one speak the truth? And what truth? For whom and where?’6 But here we have problem: what if power refuses to listen? Confronting political indifference, the intellectual must turn aside from power and seek other circuits and interlocutors that power finds less easy to ‘manage’. Palestinian Art focuses on the emergence of Palestinian modernism and its subsequent trajectories in and against successive colonial powers (Ottoman, British, Israeli) and the disruptions of exile and occupation. Its four sections are organised as thematic clusters rather than a strict chronological narrative, contextualising aesthetic developments through the cultural and political backgrounds from which they emerged: ‘From Religious to Secular Iconography’, based in painstaking research in churches, archives and homes, discusses the roots of Palestinian modernism and nationalism; ‘Memory and Resistance’ is primarily concerned with exilic memory and experience of bereavement; ‘Art from the Ghetto’ analyses artistic responses to living in a space transformed by the ‘normalisation’ of violence; and, against the objectifications of history, ‘The Evocation of Place’ presents the re-personalisation of time by memoralising the realm of the sensible – the sensations of the author’s ‘beginnings’ in Jerusalem as they resonate through the places of exile. In eschewing the unified or totalising narrative of academic orthodoxy, Boullata’s dialectic of the vernacular realm of individual stories and the imprint of memory to be found in the historical archive and visual expression opens a new interpretative space for the reader, offering an encounter with ‘something that forces us to think’. In ‘From Religious to Secular Iconography’ Boullata relates how Palestinian modernism was forged in the mid-1800s with the competing presence of European imperial powers and the pictorial conventions introduced by their evangelical church missions, alongside the new realities of modernity, from which emerged the aspiration of national independence; this nationalism was to be figured through both the new aesthetic languages and a renewed pride in traditional crafts. That is, contrary to popular perception, Palestinian Arab modernism and nationalism began long before 1948. Among Boullata’s most stunning insights – based in meticulous detective work combined with analysis of paintings, diary entries and oral testimonies collected over several years – is that the crucible of Palestinian modernism is to be found in the Arabisation and progressive naturalisation of Byzantine iconography between the 18th and 19th century by Christian Arab Orthodox icon painters of the Jerusalem School, producing work for religious institutions, homes and pilgrims, and later, Jerusalem’s collectors (54). By the end of the 19th century Russian Orthodox influence on Arab intellectual modernism had become the catalyst for further iconographic innovation which, synthesised with Italianate traditions, was to lead to the secularisation of artistic practices, the shift towards studio-based arts, and the surprisingly early involvement of photography in artists’ mastery of the new pictorial languages.7 Among the key figures were Nicola Saig (1863 -1942) and Khalil Halabi (1889-1964), in whose studio Boullata was to be apprenticed during the mid-1950s. These trends also extended to Islamic themes and practitioners exemplified by Daoud Zalatimo (1906-2001), whose historical allegories of nascent Arab nationalism were later to inform Isma‘il Shammout’s (1930-2006) narrative paintings of life in the refugee camps and Arab cultural resistance; and Zulfa al-Sa‘di (1905-1988), the artist of Sufi background whose primarily portrait canvases were the subject of the first public Palestinian art exhibition.8 Al-Sa‘di exemplifies a tradition of recognition afforded to pioneering women artists within Palestinian society to which Boullata consistently refers and to which he assigns special emphasis in a chapter devoted to al-Sa‘di, Sophie Halaby (1906-1998), Juliana Seraphim (b.1934) and Mona Hatoum (b. 1952), with an entire chapter devoted to the Bedouin photographer Ahlam Shibli. However, the development of Western naturalistic codes initiated by Halabi’s generation was to be arrested with the Nakba (catastrophe) of 1948. Boullata does not neglect the contribution of Palestinian architecture and crafts to the milieu of modernist invention. Al-Sa‘di shared the Palestine Pavilion with the young craftsman Jamal Badran (1909-1999), who was instrumental in reviving traditional Islamic crafts. In this discourse we encounter one of the few redeeming episodes in the shameful history of British political complicity with Zionism: Jerusalem Governor Ronald Storrs appointed the Arts and Crafts architect Charles R. Ashbee to oversee building projects, and through his recognition of the secular spatial use of Islamic aesthetics secured the livelihoods and development of authentic Palestinian crafts men and women against what he saw as the ‘barrenness’ of the Bezalel enterprise (81-89). The first director of the exclusively Jewish Bezalel School of Arts and Crafts, established in Jerusalem in 1906 primarily for settler retraining, had declared that Jewish art was ‘an instrument of propaganda that expressed the “soul of the nation”’ (77). To legitimise the narrative of Jewish historical continuity, techniques and designs were appropriated and adapted from the local Arab Muslim and Christian craftspersons, some of whom were employed at Bezalel only to be sacked when the immigrant had mastered the technique. Bezalel outputs were then marketed as ‘authentic’ crafts from the Holy Land (78-80). The continuous appropriation of Palestinian traditions is exemplified in a conversation Boullata relates with a Palestinian craftsman who had been persuaded by an Israeli jeweller to make a set of patterns of his traditional silver designs on the understanding that he would receive further orders. Promptly dismissed on submission of his designs, he subsequently saw them marketed as inferior mass-produced tourist trinkets (243). Despite a background of increasing violence between Jewish settler militias and Palestinian resistance, exacerbated by the Balfour Agreement in 1917, the image that Boullata brings into focus is a land of interfaith, interethnic cooperation, with a thriving middle class, which, by the 1930s had transformed Jerusalem especially into a sophisticated cosmopolitan city with museums and regular art, music and literary events. All of this modernist creative energy was to be shattered twice: in 1948 with the partition of the city and the eviction of Palestinian residents, workshops and businesses west of the ‘Green Line’, and in 1982 with Israel’s occupation of Beirut, where many Palestinians artists had taken refuge. The land and how it is understood and depicted has particularly relevance for Boullata and the issue of a dispossessed people’s sense of belonging. Native Americans have long pointed out that land does not belong to people, people belong to the land: it donates the signs and symbols that shape language and belonging whether at home or in exile. It is, as Said said, the place of ‘beginning’ (as opposed to ‘origins’ with its theological connotations).15 ‘Be’-ing and ‘longing’ are the two syllables of belonging conveying the intimacy of nearness and distance that, as Boullata explains elsewhere,16 historically inscribe Arab poetry and become embodied in the words and images of home in exile. For the author this sensibility is exquisitely captured in Mona Hatoum’s video Measures of Distance, 1988, where the Arabic script of letters sent from her mother at home under a besieged Beirut to her daughter in exile in London also function as a screen of barbed wire invoking their separation. ‘Facing the Forest: Israeli and Palestinian Artists’ is therefore amongst the author’s most critical essays. Based in considerations of how one inhabits and represents space, it analyses the distinctions in approach to landscape rooted on the one hand, in the European-Israeli drive to conquer nature and space, in which ‘mapping’ becomes a recurrent motif,17 and on the other in Arabic emphasis on culture and language. Hence, with the abrupt curtailment of the trajectory towards Western naturalist codes, Palestinian artists ‘resorted to the imagery of verbal expression to formulate a visual language that communicated their cultural codes in relation to nature and space’ as if ‘image making were an extension of the act of writing’ (252-253). Boullata writes eloquently of the influence on visual art of Arabic oral storytelling traditions, calligraphy and poetry in which women particularly excelled: a resonance between words and bodies that he calls ‘allegorical allusions’ (126), which gives us insight into how Palestinian art generally speaks of sociopolitical realities less through political rhetoric than by poetic metaphor (65). We begin to grasp this in ‘The Evocation of Place’, the author’s personal testimony of his artistic journey through the spaces of exile, where the articulation of word and image corresponds to his experience of a double exclusion, from the Western centre and the ancestral home, in what he calls the ‘view from no-man’s land’. Boullata relates how, inspired by Deleuze and Guattari’s discussion of the ‘minoritization’ of a major language, he found a neutral space of synthesis to deterritorialise ‘dominant pictorial language’ and reterritorialise his ‘cultural memory’ through the shared geometry of European abstraction and Islamic aesthetics (312). Explorations of the plastic potential in calligraphic manipulations of Arab and Christian verbal expressions produce spatial hallucinations of impenetrable gates and passages, later to give way to chromatic planes turning upon the squared circle that articulate the agonistic with the harmonious. Chapters on the cultural events in East Jerusalem and Ramallah following the second intifada in 2000 describe a sea change in Palestinian art in which bearing witness becomes the survivor’s response to the escalation of Israeli brutality.18 Organised jointly by artists and activists, these collective exhibitions and events of personal objects and stories, often celebrating the lives of murdered civilians, begin the reclamation of agency from the inertia of cultural trauma and point towards the dynamics of more recent artistic practices. The centrality in these activities of storytelling as a means of transmitting and sharing social memory is likewise reflected in the polyvocal nature of Boullata’s book, in which scholarly narrative is complemented and enriched with anecdote and remembrance derived from personal accounts, interviews and correspondence with artists and their families. Thus the book not only draws on witness testimony, it is itself a bearing witness to past and future generations;19 or better, it is a ‘gathering’ according to the etymological root of allafa the Arabic word for ‘writing’; as Khoury explains, ‘the writer gathers what has been dispersed and reshapes it.’20. To integrate the trauma of loss and separation demands a re-founding of language, through which the experience of remembering can be articulated to an interlocutor or listener capable of recognising it. Thus, the work of remembrance has a social and collective dimension, and as such, as Paul Ricoeur insists, is the ‘womb’ or ‘matrix’ of history’,21> a firmer ground than the Zionist narrative rooted in the unstable soil of myth and ersatz history. Walter Benjamin questioned the ethics of the use of history as a tool by powerful ideological forces driven by the concept of linear progression. For Benjamin a more productive basis for thinking history was as intersecting constellations of images of the past with the ‘now’ – the present as the chiasmus of past and future.22 This could well describe the structural play of Boullata’s book as it evocatively shuttles between the warp and weft of memory and archive, artistic practice and personal anecdote, intimacy and distance, continuity and rupture to weave a richly textured, multi-faceted narrative. Like all authentic research, the door that opens up insights to a concealed past also reveals possibilities for the future and indeed other possible interpretations. Palestinian Art 1850 to the Present gathers up the dispersed fragments of Palestine’s dis-membered body into a space of contemporary relevance that decentres the linear autobiography of Zionism far more vividly than either conventional art history or journalism: it restores and puts into circulation the truth of the Palestinian as a constantly negotiated historical subject. Above all, Kamal Boullata’s opus magnum stands alongside the work of Mahmoud Darwish and Edward Said as testimony to a Palestinian generation that refused to relinquish its faith in a just and radical humanism founded in the shared heritage of Palestine and Europe. Preface by John Berger, London, San Francisco and Beirut: Saqi, 2009. Published in Third Text, vol. 24, issue 4, July, 2010, pp 481-489. 1 Gilles Deleuze, Proust and Signs, trans. Richard Howard, New York: George Braziller, 1972, pp 15 – 16. 3 Edward W. Said, Orientalism, London: Routledge and Kegan Paul, 1978, pp 286, 306-308. 4 An earlier modest account was published in Arabic with an English synopsis by the Gazan artist Isma‘il Shammout, al-Fann al-Tashkili fi Filastin (Art in Palestine), Kuwait: Matabi ‘al-Qabas, 1989. 5 Kamal Boullata, Istihdar al-Makan, Dirasat fi al-Fann al-Tashkili al-Filastini al-Mu‘asir (The Recovery of Place: A Study of Contemporary Palestinian Art), Tunis: Al-Munazammah al-‘Arabiyyah lil-Tarbiyyah wa- al-Thaqafah, wa-al ‘Ulum, ALESCO, 2000. 6 Edward W. Said, ‘Speaking truth to power’ in Representations of the Intellectual, London: Vintage, 1994, p 65. 7 Already a taught practice in Jerusalem by the 1860s, the first photography studio in Jerusalem was opened in 1895 by Khalil Ra‘d who had studied photography in Basel. Boullata, Palestinian Art, p 55. 8 Palestine Pavilion of the First National Arab Fair, Supreme Muslim Council, Jerusalem, 1933. Boullata, pp 68-70. 9 Khoury, op cit, p 80. Israel has recently passed a law that criminalises the commemorative mourning of the Nakba, which of course coincides with Israel Independence Day, May 15th. 10 Ilan Pappé, The Ethnic Cleansing of Palestine, Oxford: Oneworld, 2007, pp 225-234. 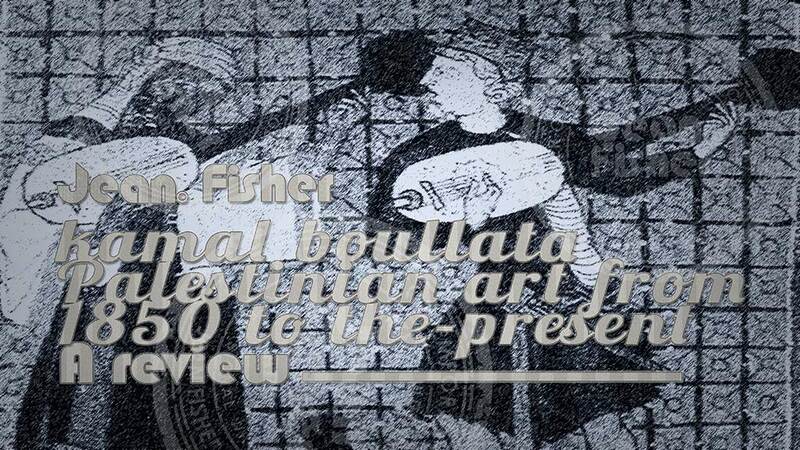 11 Boullata, Palestinian Art, pp 232, 250 n3, 278, 291-292. See also Joseph Massad, ‘Permission to Paint: Palestine Art and the Colonial Encounter’, Art Journal, 126-133. Boullata relates how even the colour combinations of the Palestinian flag were forbidden. 12 Whilst the shrub became an emblem of Palestinian dispossession, ‘defiance’ and ‘patience’, Israel chose the fruit to symbolically name the first generation sabra. Boullata, pp195-196. 13 Following the wanton bombing of Gaza, the International Committee of the Blue Shield (ICBS) announced its concern for the protection of Gazan cultural heritage, listing Canaanite, Hebrew and/or Jewish, Greco-Roman, Byzantine, Umayyad, Crusader, Egyptian, Ottoman. Julian Anfruns, ‘Heritage in Danger’, ICOM News, vol.62, no. 1, 2009, p 16. 14 Ali’s political disaffection was famously expressed through Handhala, a little boy with his back to the world who refused to grow up until he returned to the home he was forced to leave aged ten. Although not affiliated to any political faction, like his mentor the poet Ghassan Kanafani, Ali was assassinated (in London). The British authorities ultimately blamed an agent of Mossad. Arjan El Fassed, ‘Naji al-Ali: The timeless conscience of Palestine’, Electronic Intifada, 22 July 2004. Accessed 10.08.09. 15 Edward W. Said, Beginnings: Intention and Method, New York: Columbia University Press, 1985, pp xii-xiii. 16 Kamal Boullata, ‘Sharing a Meaning: An Introduction’, in Boullata [ed], Belonging and Globalisation: Critical Essays in Contemporary Art and Culture, London, Berkeley, Beirut: Saqi, 2008, pp11-21. 17 In an exquisitely argued paper, the geographer Derek Gregory showed how mapping as an instrument of military power in the control of representation and reproduction of the world continues to be performed on Palestine. Keynote talk, Symposium ‘Infrastructures and Ideas: Contemporary Art in the Middle East’, Tate Britain and Tate Modern, 22-23.01.09. 18 Ariel Sharon, accompanied by soldiers and police, forced his way into the Noble Sanctuary in the grounds of the al-Aqsa Mosque, a provocation too far for a population already disenchanted by the failure of the 1993 Oslo Peace Accords to honour its promises, which led to the immediate deaths of seven Palestinians precipitating the second intifada. Boullata, Palestinian Art, p 278. 19 Boullata notes that in Arabic etymology ‘bearing witness’ (shahida) has the same root as ‘martyrdom’ (shahaada), p 283. 20 Khoury, op cit, p 76. 21 Paul Ricoeur, Memory, History, Forgetting, trans. Kathleen Blamey and David Pellauer, Chicago and London: Chicago University Press, 2004, pp 87, 93-121. 22 Walter Benjamin, ‘Theses on the Philosophy of History’, in Illuminations, trans. Harry Zohn, New York: Schocken, 1968, p 257.